Drowning in greens! Send help! Beet greens, collard greens, turnip greens, Swiss chard, they're overflowing from my fridge like some kind of sturdy green tidal wave. A long weekend in Maine and a few nights out on the town has allowed the wholesale takeover of my crisper drawers and imbued me with an increasing sense of desperate futility every time I open the fridge. The other vegetables are disappearing with ease. Kohlrabi? Gone. Beets? Pickled, oh yes, and gone. Cabbage? Spicily sauteed and gone. Little white turnips? Sob, gone. (I loved those.) But the greens, dear me, the greens. I've decided I've got to be methodical. I can't see the green pile as some kind of towering inferno. I have to tackle it leaf by leaf, drawing deep breaths. (And every once in a while, I have to be okay with throwing some of the greens in the trash. Only the wilted, browning ones! They aren't doing anyone any good, sitting there balefully, making me feel like a jerk.) And I have to get help from the professionals. After all, who better than Alice Waters to help with getting rid of some perfectly good week-old Swiss chard? I don't own The Art of Simple Food, but so far every recipe I've tried from it has been a bit of a knock-out. In a quiet, unassuming way, mind you. No fireworks necessarily. But I like food like that. It allows you to have a conversation while you eat, being a good hostess to the people gathered around your table, or a good dinner partner to the person sitting across from you every night. Food like that fills your belly and uses up the stuff in your kitchen, like greens gone wild and old bread and the last dregs of milk and a dusty onion, and tastes good - really good, like something your mother might have taught you to make if she was a resourceful cook with impeccable taste who grew up on a farm in France. This gratin, while it does dirty more dishes than when I normally make chard (bang it in a pot to steam, drain it a little bit later and douse liberally with lemon juice and olive oil), is a lovely way to use up chard, stems and all. 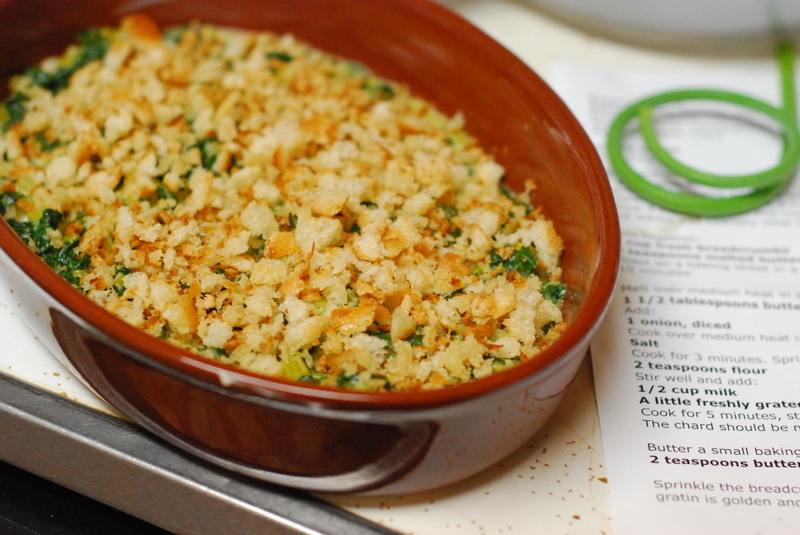 Rich and creamy without being heavy, the gratin has melting soft chard at the bottom and crispy, crunchy breadcrumbs at the top. It's the European peasant version of creamed spinach: fresher, leaner, cheaper. If you're drowning in greens like me, for God's sake, double the amounts below and take the leftovers, if there are any, to work. And be grateful. In six months time, it'll be frozen Brussels sprouts all over again. 1. Wash and stem the chard. Save half the stems and slice them thin. Bring 2 quarts of salted water to a boil and cooked the sliced stems for 2 minutes. Add the chard leaves and cook until tender, about 3 minutes. Drain and cool. Gently squeeze out the excess liquid from the stems and leaves and coarsely chop them. 2. Toss together the breadcrumbs and the melted butter. Toast on a baking sheet in a 350-degree oven, stirring now and then, until lightly brown, about 10 minutes. 3. Melt 1 1/2 tablespoons of butter over medium heat in a heavy-bottomed pan and add the diced onion. Cook over medium heat until translucent, about 5 minutes. Stir in the chard and season with salt. Cook for 3 minutes. Sprinkle with the flour and stir well. Then add the milk and nutmeg and cook for 5 minutes, stirring occasionally. Add more milk if the mixture gets too thick. The chard should be moist but not floating in liquid. Taste and add salt if needed. 4. Butter a small baking dish. 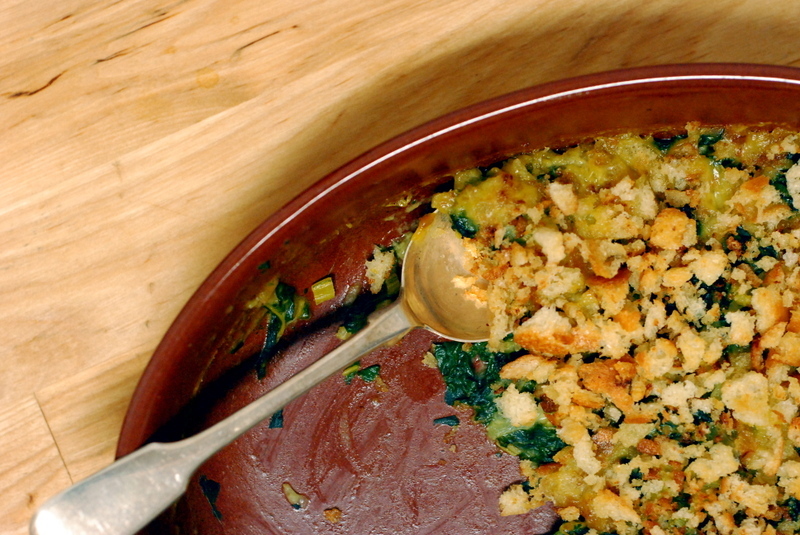 Spread the chard mixture evenly in the dish and dot with the remaining butter, cut into bits. Sprinkle the breadcrumbs evenly over the top. Bake in a 350-degree oven until the gratin is golden and bubbling, 20 to 30 minutes.